Typically, when a genetically modified crop is developed, it undergoes safety tests to ensure that (1) its chemical composition and nutrition are not significantly different from those of its conventional counterparts; (2) the only detectable differences in proteins between the two varieties arise from the inserted gene(s); (3) those proteins are not toxic, even at levels that far exceed those at which they would likely be consumed; and (4) those proteins are not allergenic (Hopkin). The four most common GMO crops are soybeans, yellow corn, rapeseed (canola), and cotton; soybeans constitute 60 percent of all GMO crops globally (Paarlberg, 112-3). 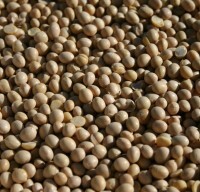 The most common GMO soybean crop has been modified to express a gene giving it resistance to glyphosphate, or Roundup. I could find information about one variety of this crop, called 40-3-2 soybean, which was approved in 1996 in the United States and Argentina (Wenzel). The transgenes inserted into 40-3-2 soybean are contained on a plasmid (a small, circular piece of DNA); the plasmid is constructed with (1) a promoter from the cauliflower mosaic virus (this itself was not transferred into the soybean’s genome, according to Wenzel); (2) a sequence from the CTP EPSPS gene of the plant Arabidopsis thaliana, which enables the glyphospate-resistant protein to be expressed in the soybean’s chloroplasts; (3) a gene called CP4 EPSPS, which was obtained from the CP4 strain of Agrobacterium and confers glyphosphate resistance; and (4) NOS 3′, a stop codon from Agrobacterium tumefaciens. Other elements are (1) a kanamycin-resistant marker gene from Escherichia coli (antibiotic-resistant marker genes are being phased out of GMOs), (2) a replication origin from E. coli, and (3) a glucoronidase marker gene from E. coli (CERA). This plasmid was inserted into cells of shoot-apex tissues from the soybean strain A5403 with a gene gun (Wenzel, CERA); these tissues were cultivated on a growth medium to promote adventitious buds. Of these, 150 were selected for cultivation in a greenhouse; varieties were then selected for desirable traits, including expression of the glyphosphate-resistant gene. Field tests were conducted from 1991 to 1993 in the United States and Puerto Rico (CERA). Across bacteria and plant species (Adler), EPSPS genes code for an enzyme called 5-enol-pyruvylshikimate-3-phosphate synthase, which is integral in amino-acid synthesis through the shikimate pathway. Simply put, this gene is necessary in order for plants and bacteria to manufacture their own amino acids — without this ability, they would die. Glyphosphate, the active chemical in Roundup, normally binds to this enzyme, inhibiting its functions and killing the plant. However, scientists found a version of this gene in a bacteria species, called A. tumefaciens strain CP4, that was impervious to glyphosphate — the chemical could not bind to and disable the enzyme produced by the gene. In Roundup Ready crops such as soy, the bacteria-derived herbicide-tolerant EPSPS gene replaces a counterpart herbicide-sensitive EPSPS gene in the plant (CERA). Therefore, the plant can synthesize amino acids normally, as the glyphosphate from Roundup has no effect on it. After preliminary safety testing (similar to that described above), numerous animal tests were conducted to determine if the transgenic soybean was dangerous when consumed by vertebrates. Experiments used raw and processed soybeans on quail, chicken, rats, cows, pigs, and catfish. The transgenic soy was not found to have an effect distinguishable from that of conventional soy (Wenzel). Safety testing is incredibly important, but demands for excess safety testing might do harm to the animals who are being used in this testing. Of course, scientists are never able to declare that any technology is risk-free, whether they are talking about biotech crops, vaccines, or energy sources. To demand proof that a type of technology is 100 percent safe and completely free of risk would indicate a misunderstanding of science. The scientific consensus comes with reminders that our understanding of genetics, environmental factors, and biotechnology could expand in the future, giving us better information on which to base our analyses of risk in context of other risks. Many people, especially those who don’t directly benefit from GMO technology (e.g., the First World consumer), don’t think the possible risks make GMO crops a worthwhile endeavor. Though controversial, genetically engineering crops to require fewer pesticide applications and less tilling of the soil could have positive ecological impacts. GMO soybeans have especially enabled a shift to low-till or no-till systems, leading to reduced fuel requirements for tractors and additional carbon sequestration in the soil. This is not only good for the environment in that it requires less fuel — it is good for land-dwelling animals who are often killed during the tilling process. A move toward low- or no-till agriculture could result in fewer animal deaths. Since the introduction of GMO soybeans, the vast majority of soybean fields are no-till. Between 1996 and 2008, the use of tractor fuel on U.S. soybean farms has increased by 2.1 percent, while hectareage increased by 16.3 percent, for a net reduction in fuel use per hectare of 12.2 percent. A couple of industry-affiliated economists calculate that this has resulted in a 2,295.3 million kilogram reduction in CO2 emissions; they additionally estimate that low-till and no-till soybean farming has resulted in carbon sequestration that has reduced CO2 emissions by a maximum of 38,057 million kilograms (Brookes). Use of Roundup enables a move away from weed-killers such as atrazine (UCS), which is known as an especially environmentally persistent endocrine disruptor that has been shown to have feminizing effects on male frogs (Keim). However, although Roundup might be less ecologically harmful than other herbicides, practices that truly favor environmental preservation would move away from all chemicals that exert environmentally deleterious effects – if one is to use GMO crops, it seems that for the sake of the environment crops that are insect-resistant and therefore not in need of insecticides would have a more positive impact. This is what makes the GMO wheat currently under development so exciting — if it works as planned, it will need no pesticides whatsoever. The British “mad cow” scandal surrounding bovine spongiform encephalopathy and Creutzfeld-Jakob disease in 1996 coincided with the introduction of GMO crops, specifically Roundup Ready soy. Paarlberg claims that this coincidence could have played a major role in Europe’s subsequent rejection of GMO technology in agriculture. Though mad cow disease was not related to the genetic engineering of foods, the scandal contained themes of a centralized food supply and a mistrust of government regulators to ensure food safety. This essentially led to a ban on GMOs in Europe, when in 1998 the European Union placed an “unofficial moratorium on any new case-by-case approvals of GM crops” (Paarlberg, 17). Despite a lack of evidence that GMO crops weren’t safe to eat, a precautionary approach made sense to many, since consumers did not feel that the technology tangibly benefited them anyway (Paarlberg, 16-7). Farmers, however, saw immediate benefits from GMO soybeans. The switch from conventional soybeans to Roundup Ready soybeans resulted in a net savings estimated at $25 to $78 per hectare annually (Paarlberg, 33), and Monsanto reaped “45 percent of the surplus generated by GM soybeans,” while “downstream purchasers” in the United States received approximately 10 percent of this surplus. These savings did not wend their way down the line to the consumer; seeing no price cut, consumers had little motivation to embrace a technology they did not understand and that might have unknown risks (Paarlberg, 34). So far, however, there have been no disasters, and potential risks have been averted. For instance, a company called Pioneer Hi-Bred wanted to enhance the nutrition of a soybean variety intended to be used as animal feed by inserting a gene from the Brazil nut. Because of concerns that the animal-feed-only soybean would find its way into the human food supply, the FDA advised allergenicity tests; when the experiments concluded that the GMO soybeans contained a nut allergen, Pioneer Hi-Bred ceased development of the product; it never progressed beyond initial development stages (Paarlberg, 31). It seems that, so far, no health or environmental disasters have arisen from GMO crops. As long as high safety standards are maintained, the science behind GMO foods is not cause for alarm, though it is certainly not without risk. Personally I am much more concerned with harmful corporate policies, which are enabled under current laws and legal decisions. Perhaps corporate abuse is to be expected when research into biotechnology in food production is almost exclusively in the purview of the private sector; public opinion seems to be against tax-funded research, even if the technologies produced by such research are more in line with the public interest. Adler, J. (2011). The Growing Menace from Superweeds. Scientific American, 304: 74-79. Hopkin, K. (2001). The Risks on the Table. Scientific American, 284: 60-61. Paarlberg, R. (2008). Starved for Science: How Biotechnology Is Being Kept Out of Africa. Harvard University Press. Wenzel, G. (2008). “The Experience of the ZKBS for Risk Assessment of Soybean.” Journal für Verbraucherschutz und Lebensmittelsicherheit/Journal of Consumer Protection and Food Safety. 3.Suppl. 2: 55-59.